Et Verbum: Simple instructions On The Holy Eucharist As A Sacrament And Sacrifice by The Very Rev. Geo. Edw. Canon Howe. Part 19. Simple instructions On The Holy Eucharist As A Sacrament And Sacrifice by The Very Rev. Geo. Edw. Canon Howe. Part 19. If the reader has understood the last chapter, and realises the importance of what it teaches, he will surely endeavour henceforth to assist at Holy Mass with greater fervour and devotion than he has perhaps been accustomed to do in the past, and also more frequently. To this end, the following methods may be suggested. A good practice might be to take the various Ends for which it is offered, and put a different one before the mind, each time we hear Mass. If, for instance, we some day feel ourselves more than usually fervent and spiritual, we could spend the whole time of Mass in adoring the Goodness and Mercy and other attributes of God, recognising His awful Majesty and Sanctity, while acknowledging our own nothingness before Him. It is well to unite our feeble effort of praise and adoration with the infinite worship of the Divine Victim on the Altar, that our united voices may rise in blended harmony before the eternal Throne, and our weakness be aided by His almighty power. If we have just obtained an answer to our prayers, or received some other mark of God's favour, thanksgiving may well occupy our thoughts during the short half-hour of the Mass, which then becomes truly Eucharistic. On another occasion, we may possibly see spiritual danger ahead of us, or have some temptation or trial to bear, some examination to pass, etc. : let us that morning humbly petition God to bestow on us the grace and strength we need, or grant success to our efforts and endeavours. Some other time, it may happen that we are in sin, or at any rate that we feel more vividly the guilt of our past lives ; let us profit by these salutary emotions to spend our time in reparation to God's offended Majesty, by repeated acts of heartfelt contrition, and let us offer Him His Divine Son on the Altar in atonement for our trespasses, and in propitiation of the wrath they have incurred. 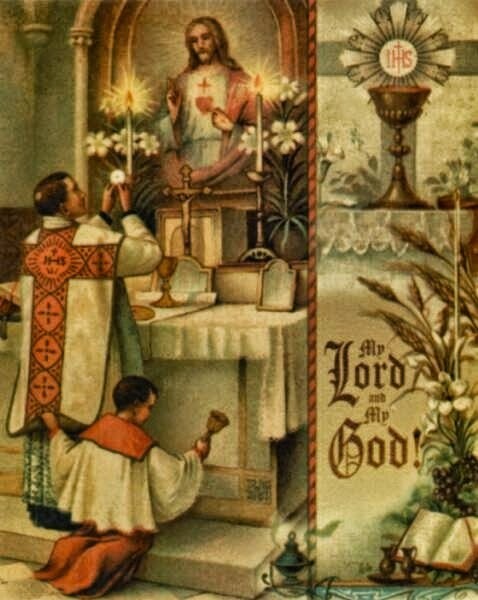 Thus we can vary day by day, as circumstances may suggest, the objects for which we pray at Holy Mass. With some, this variation and change will be found useful to prevent monotony or routine, and such as find it to be so, may do well to keep to the practice. 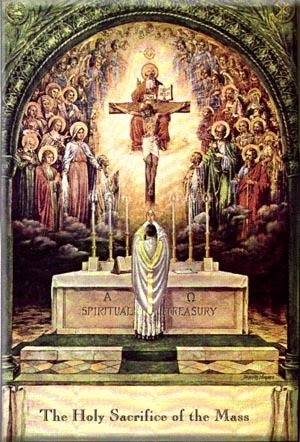 Yet, as the Holy Sacrifice is offered for all these four ends, and so enables us to fulfil all our obligations to God, it may be wiser and more profitable to keep all four ends in at every Mass we hear. For this purpose, as an aid to memory and devotion, the Mass may naturally and conveniently be divided into four chief parts. 1. Preparation of the people. The first portion of the Mass, from the commencement down to the Credo, is called the " Mass of the Catechumens," for the reason already explained, and may be taken as our preparation for the Sacrifice. During this time, we should excite our hearts to feelings of humility and contrition for sin, so as to fit ourselves to assist worthily and profitably at the Divine Liturgy. Hence, acts of sorrow for sin, of reparation for the evil we have done, would most suitably occupy our attention, and serve as a fitting introduction to the more solemn parts of the Mass to follow. 3. Canon, which extends from the Sanctus to the Pater Noster. The prayers here are always said in secret, for greater reverence and respect due to the tremendous mystery effected at the Consecration, wherein Our Lord comes down on the Altar, in His veiled and sacramental form. The vast Creator deigns to be ! " Nothing could be more becoming now than profound adoration, animated by lively faith in the Real Presence, adoration such as the shepherds paid to their new-born Saviour in Bethlehem. 4. Communion. —The last part of the Mass is called the Communion, inasmuch as in this the priest receives his holy Communion, and consumes the Victim of the Sacrifice; it extends from the Pater down to the end. Here also the Faithful approach the Holy Table, if desirous of doing so; if they do not, they should at least endeavour to supply the omission, by making what we have already termed a Spiritual Communion, which, when rightly made, is very beneficial to the soul. During this last portion of the Mass, we should make acts of thanksgiving to God for all He has done for us, not least, for permitting us to be present at the renewal of the sacrifice of the Cross, or perhaps even giving Himself to us in Holy Communion. This second method of hearing Mass, by keeping the four ends of Sacrifice in view, is the better one, for then, at every Mass we hear, we fulfil the four-fold duty we owe to God. It should not be difficult, after a little while, to fall into the way of doing this ; yet each one is free to follow any method, according as inclination or devotion may lead him. There were three classes of people present on Calvary's height, as Our Lord sacrificed Himself for our redemption. First, there were those engaged in crucifying Him, and all who in various ways insulted Him, at the very time He was proving His yearning love for them. They were scoffers who derided Him, their hearts were hardened, and they heeded Him not. Then, there were others who, without wishing to offend, went there out of mere curiosity, to see what was doing, and learn the end of One who had been famous among them, by the miracles He had wrought, and the mercies He had bestowed. Lastly, there were the few followers of Our Saviour, who had been faithful to Him throughout, their hearts full of faith, love, and compassion. Foremost among these was of course His holy mother, the Virgo dolorosa, heart-broken at the sight of His sufferings ; and with her were the holy women and the beloved disciple, S. John. The same classes that were seen on Calvary are often present also at the Sacrifice of the Mass. First, there are some who go in the state of grievous sin, without sorrow or determination to amend. Their souls are of course most displeasing to God, who knows their unhappy state; all the same, they must not neglect it, for, with good dispositions and intentions, it may be to them the means of true repentance, and forgiveness of sin. For the same reason, they must on no account miss a Mass of obligation because of their souls being at variance with God for the moment ; this would be to lose perhaps that very grace of conversion, apart from the fact that the omission would bring additional guilt to their souls. Then, there are some who go to Mass through unworthy motives, such as curiosity or vanity, to see and be seen ; they long to know who are at church, how they dress and so forth, anxious also to be seen themselves and admired by others, no less thoughtless and distracted. While, lastly, others also are there, in great numbers, let us hope, animated with the most worthy dispositions of faith, love, and reverence, who assist with much profit at the Holy Sacrifice, and come away strengthened in grace, and enriched with merit for future reward.—Let it be our endeavour to take rank among these last, and so make some amends to our Divine Victim for the sins and failings of the others. Yet another method of attending Mass is common among the Faithful, most pleasing to Our Divine Lord and most helpful to ourselves. It is to pass the time in silent meditation on the Crucifixion and Death of the Son of God. We can in spirit place ourselves near the Cross, in company with Our Lady of Sorrows, reverently and attentively watch the scene of the dread Sacrifice, and expressing from time to time sentiments of compassion, thanksgiving, love, and contrition. If we find it difficult to prolong this meditation throughout the whole of Mass, we can aid our devotion, by reciting prayers in honour of the Passion, or by saying the sorrowful mysteries of the Rosary. If the Mass be a memorial of the Passion and Death of Our Lord, it follows that devotions in honour of the Passion are most in harmony with the august Sacrifice. Again: we may use the Ordinary of the Mass, that is, the very prayers that are being said by the officiating priest. We know that he is associated with Our Great High Priest, Jesus Christ, in offering the Divine Sacrifice ; he is acting with and for Christ, his prayers, therefore, are, in a sense, the words of Christ Himself. Can we, then, do better than unite with the priest and with Jesus Christ, in reciting the most appropriate prayers, ordained by the Church for this Divine act? The priest offers and prays : Jesus Christ unites Himself with him : let us then associate ourselves with both, in the selfsame offering and form of prayer. As tastes and devotion in the Faithful vary so much, they may during Mass use any prayers which they find suitable to the bent of their minds, and helpful to devotion ; for instance, the Litany of Jesus, or of the Sacred Heart; the penitential psalms ; acts of Faith, Hope, Charity, and Contrition, etc. 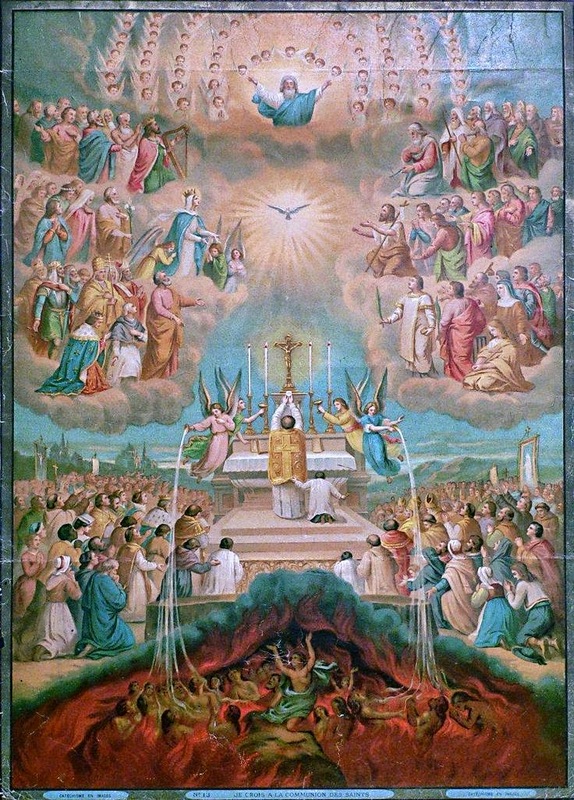 The decrees of the Council of Trent impress upon us the reverence with which we must hear Holy Mass : " If we must needs confess that no other work can be performed by the Faithful so holy and divine as this tremendous mystery itself, ... it is also sufficiently clear that all industry and diligence is to be applied to this end, that it be performed with the greatest possible cleanness and purity of heart, and outward show of devotion and piety" (Sess. XXII.). From these words both priests and people may learn a lesson—the former to say Mass with all possible devotion, the latter to assist at it with all piety and fervour. The Jewish historian Josephus states that seven hundred priests and levites served daily in the Jewish Temple: they slaughtered the victims, cut them to pieces, and burnt them at the altar; and yet, with all this, they preserved the utmost reverence and silence, so that it might almost be thought there was but one priest officiating. S. John Chrysostom says it was the same with the early Christians ; as they crossed the threshold of the church, they stooped and kissed the ground, and the silence that prevailed during the celebration of the holy Mysteries could hardly have been greater had the Church been empty.
" Reverence My sanctuary," said Almighty God to His people of old (Lev. xxvi. 2). With how much greater force will this command apply to the temples of the New Law, especially during the offering of Holy Mass. In church, therefore, we must be reverential and attentive, restraining our eyes, still more our tongues, and avoiding all vanity of dress and demeanour, lest we deserve to be treated as Our Lord treated those who bought and sold in the Temple (Luke xix. 45). Very young children should be left at home and not brought to Mass, for they often disturb not only those who bring them, but other people also, and even the priest at the Altar. If they must be brought, let it be to an early Mass, and let parents endeavour to keep them quiet, above all not encourage their noise and restlessness, as some seem to do, to the great inconvenience of those around them. S. Paul says that " in the name of Jesus every knee should bow" (Phil. ii. 10). How much more should we bend our knees when Jesus Himself is present before us, hence, out of reverence for the Holy Sacrifice, it is well to remain kneeling all the time of Low Mass, or at any rate at the more solemn part, from the Consecration to the Communion. If we follow out the advice and suggestions here given, we shall resemble the faithful few who stood on Calvary, as Our Lord offered the first great Sacrifice on the Cross, and the graces we receive from Its renewal on our altars will be very great and precious.